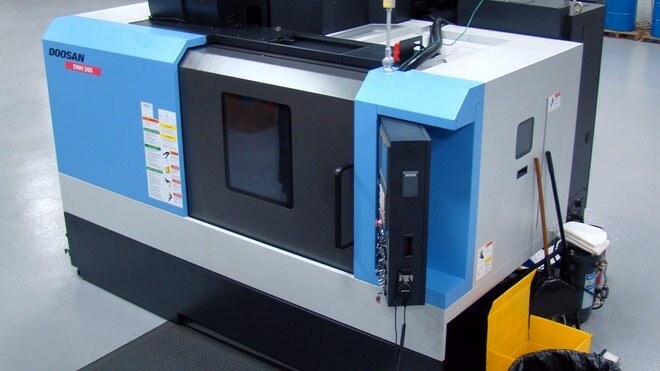 Doosan DNM 500 CNC Mill Arrives | KLH Industries Inc.
Just in time for the holidays, KLH received a 7-ton stocking stuffer: a new Doosan DNM 500. Even though it wasn't wrapped with a fancy ribbon, this vertical CNC machining center gives KLH the gift of increased CNC milling capacity. Just what we wanted. The DNM 500 features a 12,000-RPM spindle and a 4th axis interface, which means smaller tooling and better surface finish on complex dimensions. This machine is only the first of three new CNC machines on their way to KLH. The next scheduled machine gives the gift of additional CNC turning capacity, but in a 'smaller' way.